Want to be even better at content marketing? Let us help. Our share buttons, related content widget and social analytics will turn your blog and business into a traffic-generating machine. Get Shareaholic for your site. Reading is easily one of the best ways to become smarter. There is no intellectual equivalent to allowing oneself the time and space to get lost in another person’s mind, because in so doing we find ourselves. Sometimes, a good book is all you need to learn more and refresh your mind. Of course, when it comes to content marketing, an excellent way to develop your skills is by doing. But whether you’re a self-proclaimed guru or self-aware novice, you’ll still learn plenty from reading how others are mastering the craft. What’s one must-read book (or e-book) on content marketing for small business? The YEC is an invite-only organization comprised of the world’s most promising young entrepreneurs. In partnership with Citi, YEC launched StartupCollective, a free virtual mentorship program that helps millions of entrepreneurs start and grow businesses. Epic Content Marketing by Joe Pulizzi is a must-read. Pulizzi is one of the leading voices in the content marketing realm, and his book breaks down the key aspects of effective content marketing in an easy-to-understand format. Made to Stick: Why Some Ideas Survive and Others Die by Chip and Dan Heath is perfect for small business entrepreneurs. It explains why people remember some things and not others. One of the most important pieces is to make sure that you’re focused on creating memorable content, not just SEO-focused content. This is a great book by my good friend, colleague and New York Times best-selling author, Mr. Dave Kerpen. Likeable Social Media will teach you how to create an irresistible brand and build your business through social media — a vital element for business owners, especially in 2014. Jay Baer’s book, Youtility, is a paradigm shift with practical application. His content marketing strategy demonstrates how small businesses can help more clients and reach more of their target customers. With actionable case studies, you’ll go from blueprint to building your own “youtility” with real-time relevancy, self-serve info and radical transparency. 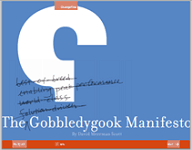 A good marketing e-book by author David Meerman Scott is The Gobbledygook Manifesto. It’s a well-written and short book that helps marketers avoid jargon that baffles audiences. With Meerman Scott’s advice you’ll soon be able to craft simplistic and understandable messages that resonate. Ann Handley and C.C. Chapman wrote a strong book, Content Rules, about using content to engage prospects and provide them with value. Their book details how to communicate an effective voice, get the right message across and grow a fan base. Our marketing manager has read Inbound Marketing: Get Found Using Google, Social Media, and Blogs by Brian Halligan and Dharmesh Shah and found it really helpful. The New Rules of Marketing and PR by David Meerman Scott is one I would highly recommend. It’s a great primer into the different outlets out there and how to get started with each. Back when I ran Blank Label, I read Confessions of an Advertising Man and it changed my life. David Ogilvy’s book proved itself timeless many years ago thanks to pithy writing and lines like, “Tell the truth, but make the truth fascinating.” Ogilvy teaches ways to quickly give audiences the information they need, which will always be relevant. When I read sections that were written for a different era, I found myself reworking the idea to fit the challenges I face and channels that I use. After reading this list, you might wonder why I included suggestions for books about advertising, PR and gobbledygook. The fact is, content marketing campaigns are at their best when integrated with all other facets of digital. Alas, all of it is also content, one way or another :). Have you read any of these? What books would you add to this list? Also, if you’re a fan of our blog, and want our latest posts sent straight to your inbox, subscribe here or below. p.s. We’re looking for new talent to join the Shareaholic team. See our openings.